Target Audience: NGOs and non-profits working on digital literacy, e-participation, active citizenship, empowerment of different vulnerable groups in society; EU policy makers; researchers and academics; educators, citizens. 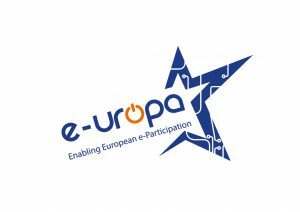 The “Enabling Civil E-participation in Europe” conference will be held on 8th Dec. 2015 between 13:00 and 16:00, followed by a cocktail, in the European Parliament in Brussels. The conference is a part of an EU-funded project “Enabling European e-Participation (E-UROPa)”, implemented in 11 countries, aimed at raising awareness about e-participation tools & engaging European citizens in the existing opportunities for e-participation.The conference objective is to bring together policy-makers, EU officials, e-participation experts, civic activists and citizens at national and EU levels to discuss democratic participation in the digital age. It is also a unique opportunity for the European digital inclusion sector to exchange achievements and ideas with policy makers at EU and national levels. The half-day conference consists of two panels: The role of ICT in active citizenship, moderated by MEP Schöpflin (EPP, Hungary), and Digital literacy, access and provision of e-services, moderated by MEP Lauristin (S&D, Estonia). The conference will be followed by a workshop with three working groups focused on e-government services, structured e-participation and ICT tools enabling grass-root citizens’ initiatives. It will be practice oriented and will focus on how to encourage e-participation of different groups. Telecentre Europe Guidelines for NGOs on e-Participation will be presented. It will take place on 9th Dec. from 9h in the Delegation of Catalonia to the EU. To participate in the Telecentre Europe conference and workshop registration is required. More about the workshop here.